The advantage is easy to see. 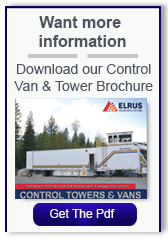 By providing a 360° view and complete control of your spread, ELRUS Control Vans & Towers can significantly increase production. A centralized operating station offers the added benefit of improved safety for everyone onsite. Whether you need a full control van and tower or are looking to install a pop-up or stationary tower with an unbeatable view, there is an ELRUS tower that will improve your site safety and efficiency.